For those of us who walk closely with people living through poverty and homelessness, or are a part of a socio-culturally diverse faith community, we know that when it comes to getting a job many of our friends face different barriers. For many of my friends living through homelessness, some barriers stem from their present situation–unmanaged hygiene, poor interpersonal communication skills, PTSD. Some barriers stem from their past–large gaps in work history, undereducated, poor choices resulting in some sort of criminal record. I had a friend who was educated and had a fair work history (not stellar, but not terrible). She could not get a job due to an arrest from 6 years ago. The crime was theft. What did she steal? Food. From a grocery store. Before Virginia’s Governor passed the so-called “Ban the Box” order (passed on “Good Friday”), some of our friends in need as well as some in my church family couldn’t even get an interview as their application revealed a poor choice in their past. Now this question will not appear on the application. Now a friend in need has a chance to get an interview. No doubt employers will run criminal background checks. Personally, I think that is wise. But if the employer chooses not to employ a friend in need at least they will be saying no to a person, rather than an checked box on an application. At least our friend in need had an interview and a fair shot at the job. Who knows, an employer might just like what they see and choose to give our friend in need a second chance. And that second chance may just make the difference. I am grateful for this law. It is more restorative and less retributive, and restoration is what God’s people are supposed to be all about. Above all I am thankful for God’s mercy and grace. He is a God of many second chances and He always seeks to forgive and restore. May we carry on in joining Him in His work of restoring lives. Oh by the way that friend I mentioned earlier finally got a job. 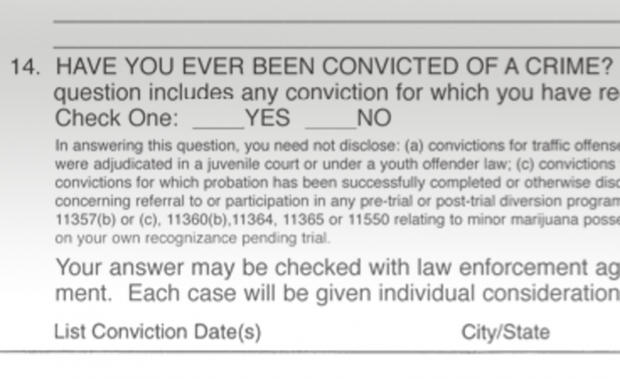 For some reason this particular application didn’t ask about the criminal record. It was the first in almost 85 applications that didn’t ask. She got a call back for an interview. I encouraged her to be forthright about the arrest and at the end of the interview to be sure to tell hiring manager. The hiring director appreciated her honesty and called me for a reference. This entry was posted in Philosophy, Social Justice. Bookmark the permalink. Great post. I firmly believe that everyone, at some point in life, needs forgiveness and a second chance because we all sin and make choice we later regret. Our sin and poor choice may not be entangled in poverty and homelessness but sill, we need grace too. So we ought to extend that same grace and mercy to others, including those struggling in poverty, who are trying to make changes. I agree bro. What I have found is that this initiative not only helps the poor but others who made bad choices along the way. It bothers me to know there are some who want to draw a solid line between issues like this and what the Church should be concerned with. Some people’s missiology and ecclesiology doesn’t make room for addressing social issues. What I think this indicates is a lack of socio-cultural diversity among their faith communities that breed a lack of familiarity with how these issues profoundly affect lives. Given the nature of Williamsburg Christian Church we do not really have much of choice as we had many who couldn’t get jobs (or consistent jobs) due to sins/poor choices of the past. For the good of my brothers and sisters, and for all others, I am grateful for this new law. Thanks for a great blog, a transformative story.